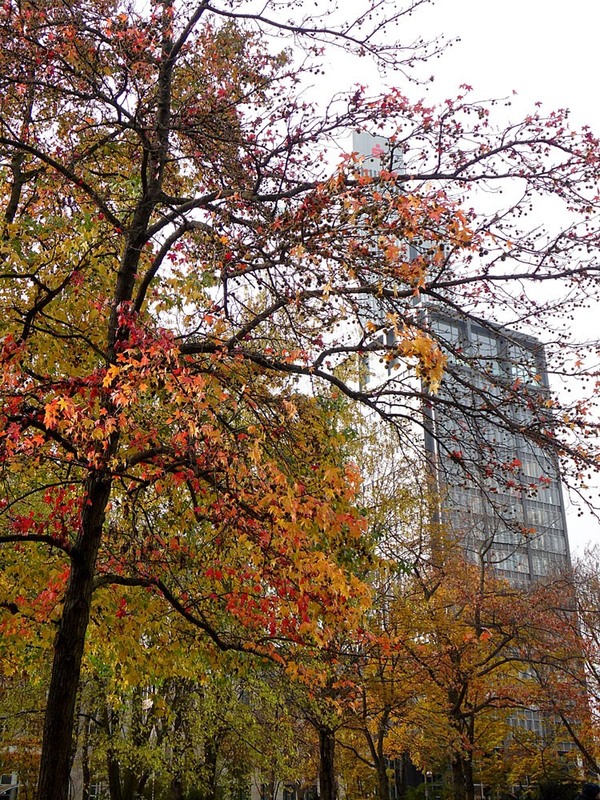 At the weekend we travelled to the financial hub of Germany in search of Manhattan skylines and Apfelwein. 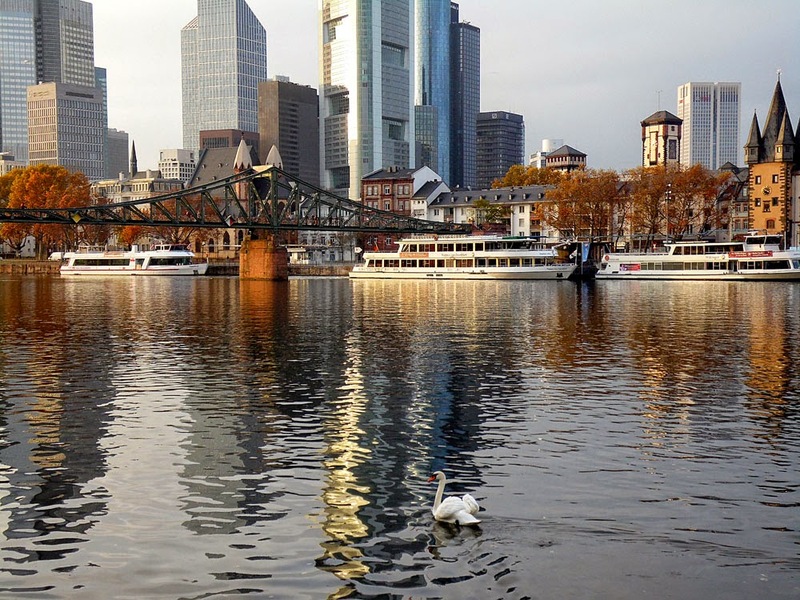 Frankfurt am Main is not a recommended destination for a Berlin day-trip - it takes over four hours on the ICE Intercity Express and is a distance of about 550km - but we were over-nighting and we got our tickets through a '25th Anniversary of the Fall of The Wall' deal by Deutsche Bahn. They were offering return tickets to anywhere in Germany for just 25€. As the usual cost of a ticket to Frankfurt is currently 123€, that was a fair saving. We will probably have to wait until the 30th anniversary for them to repeat the offer. 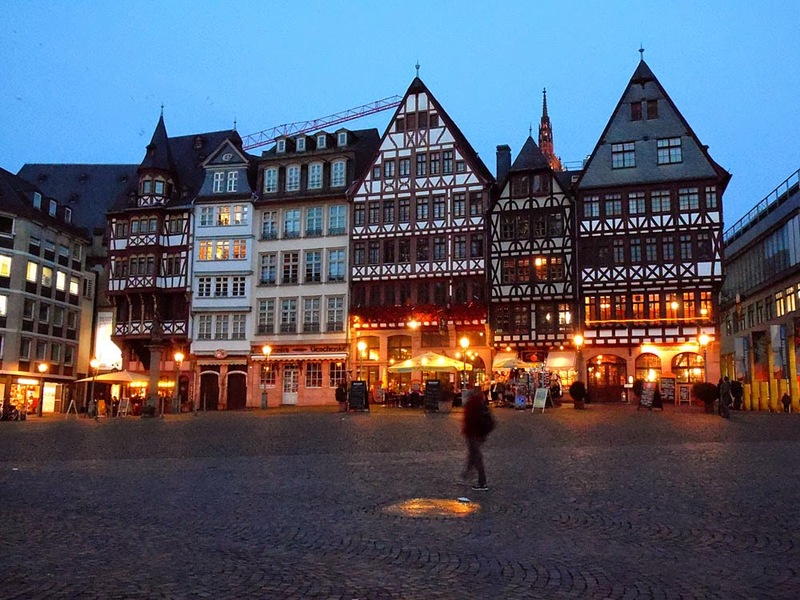 Frankfurt is believed to get its name from 'ford of the Franks', where 'the Franks' were a Germanic tribe originating in Roman times around the Rhine region (though confusingly France - in German Frankreich - gets its name from them too). The 'ford' (German: Furt) is a river-crossing, usually where it is shallow enough to at least wade across. Here it refers to the river Main (pronounced to rhyme with 'mine'), which runs East to West from the Bavarian Jura mountains 527km until it discharges into the Rhine. Frankfurt am Main is famous nowadays not for its river crossing but for its skyline of skyscrapers, giving it the nickname 'Mainhattan'. The skyscrapers might not look all that tall, but that is because they are set a good distance back from the river. 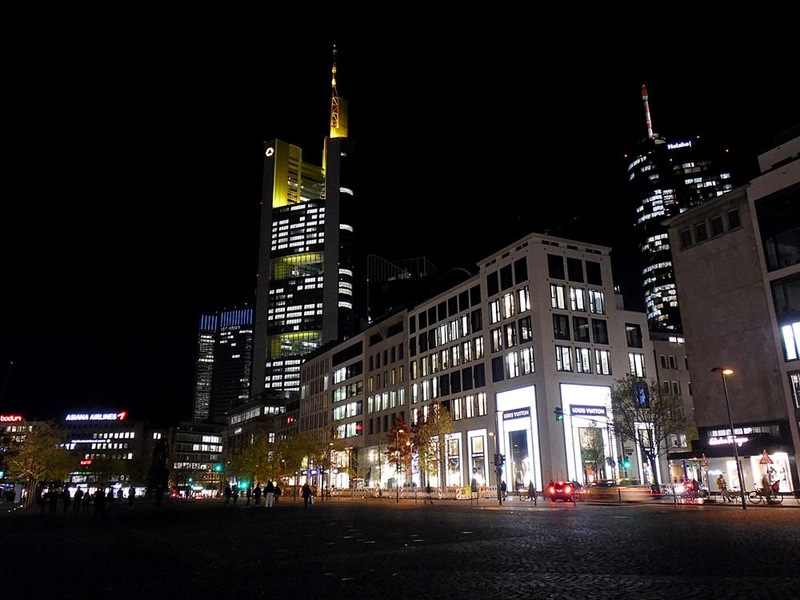 The tall tower in the middle in the photo below is the 259m high Commerzbank Tower, the tallest skyscraper in Germany. That's not as tall as the Empire State Building in the real Manhattan (381m not including the tip), but pretty tall anyway. By comparison, the Berliner Fernsehturm is 368m high.Whoo-oo! Berlin wins! Pull back, and there is more skyline, plus notice the tall crane. Lots of building work is still going on, in this case around the cathedral. The skyscrapers become more dramatic as the sun goes down and the lights come on, plus flocks of birds circle the sky looking for somewhere to roost. 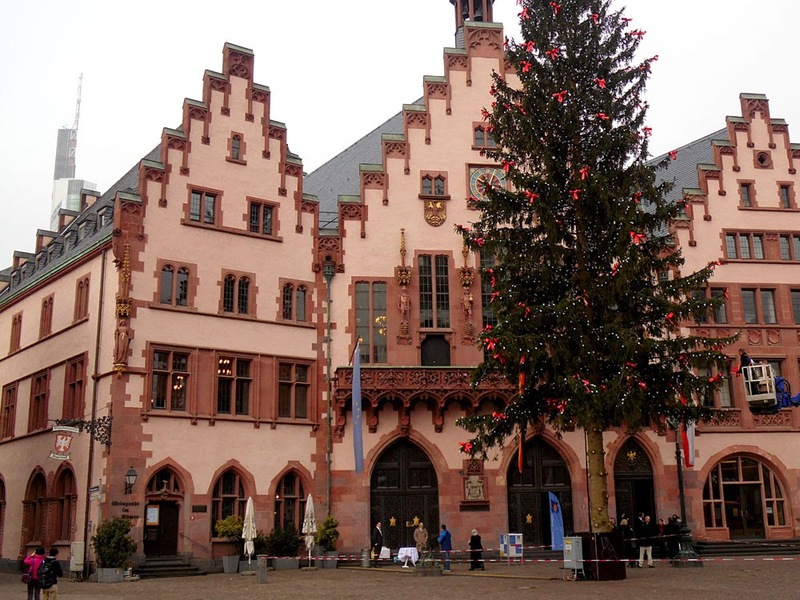 Frankfurt Altstadt probably began as a Roman military settlement beside the ford, protecting the road from Mainz (castrum Mogontiacum) to the Roman town of Nida, which is now underneath the Frankfurter suburb of Heddernheim. The military fort was probably established in the last quarter of the 1st century BC, and was converted into a civilian villa in the 2nd century AD. This area, which was on a slight hill on an island in the Main and above the swampy ford, was probably permanently settled by the time of the Merovingians (a Frankish dynasty that conquered this area in about 500AD). Frankfurt's Gothic cathedral was constructed in the 14th and 15th century to replace a church dating back to Merovingian times. 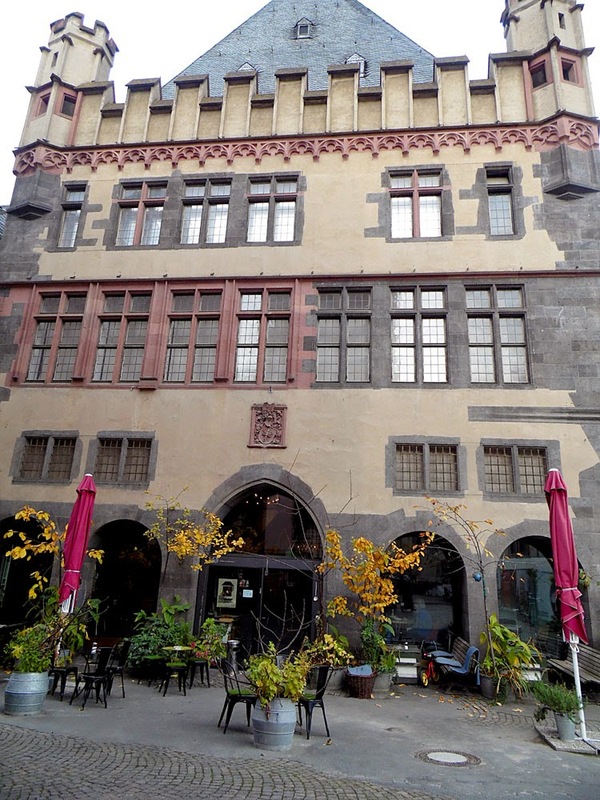 Coincidentally the Domhügel (cathedral hill) of the early settlements became the location of the old town hall, which was a complex of nine houses purchased by the city council in 1405 from a wealthy merchant family with the surname Römer. The surname Römer means Roman. Today these houses are nown as the Römer, but this is nothing to do with them being on the original Roman settlement. The rear of the Rathaus buildings is in the more typical 19th century 'Gothic gone bonkers' style, incongruously married with a 'Bridge of Sighs', but to be honest I like that kind of thing. I also like the OTT mediaeval-revivalist details added to crazily corrupted neo-classicism. It's all good fun in the end! These buildings date all the way back to their reconstruction of previous buildings in 1981-1984. 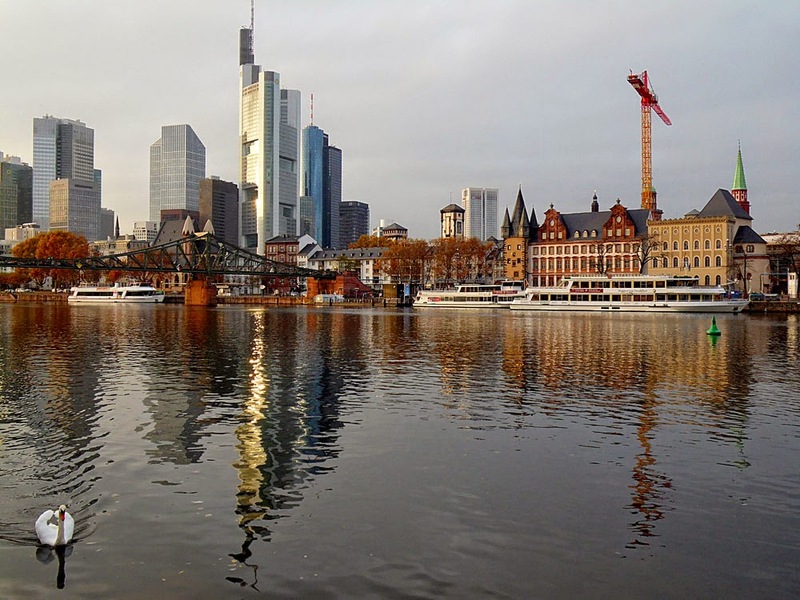 Unfortunately, during World War II much of old Frankfurt was completely destroyed, particularly through a British bombing raid on the night of 22nd March 1944 when 1,001 people were killed. 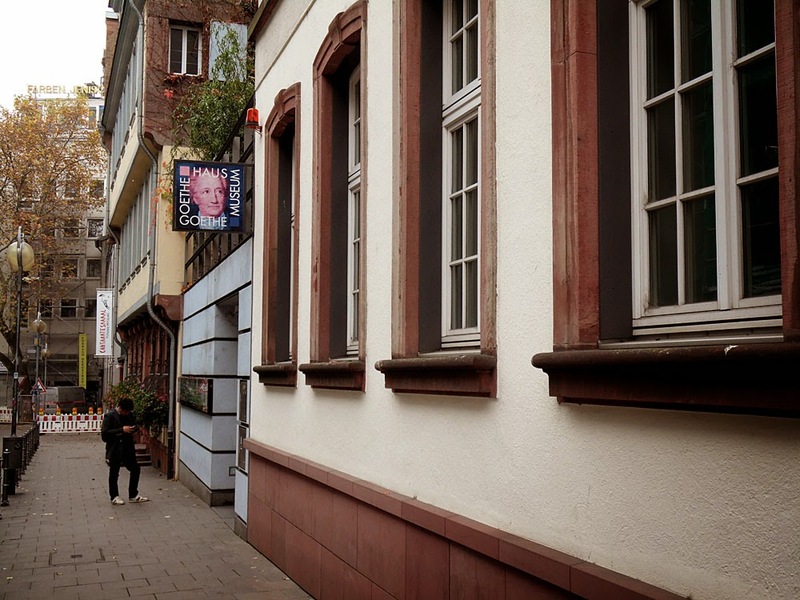 This area is one of the few parts of old Frankfurt that has been reconstructed; the tourists might be missing out on picture-postcard buildings to photograph, but the Frankfurter residents have gained smart new shopping centres, and have wealthy banks and businesses setting up their headquarters here. I know which I would prefer, but then I don't work for the Frankfurter Fremdenverkehrsamt (Tourist Board). 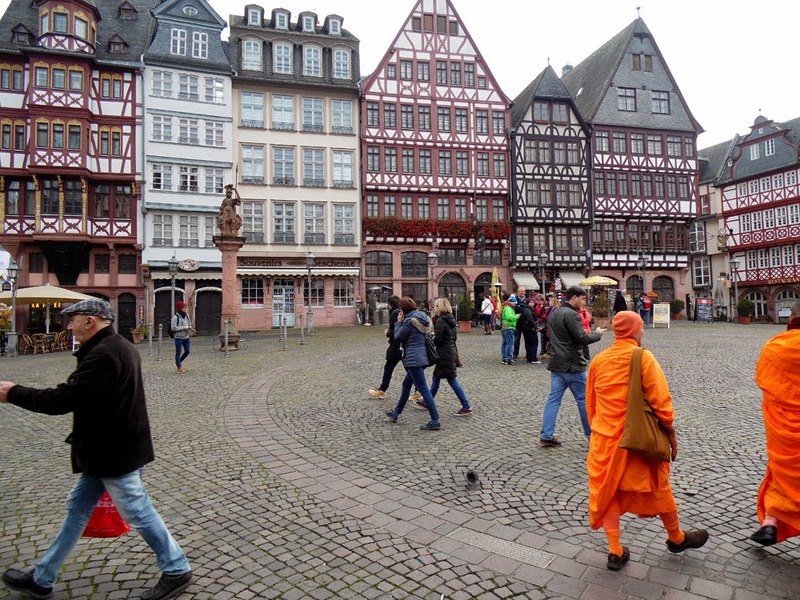 Anyway, more photos of those six buildings, with added Buddhist monks. Other buildings around the Römerberg have been reconstructed after the war. I haven't got too many photos around here as most of them would be of building sites. 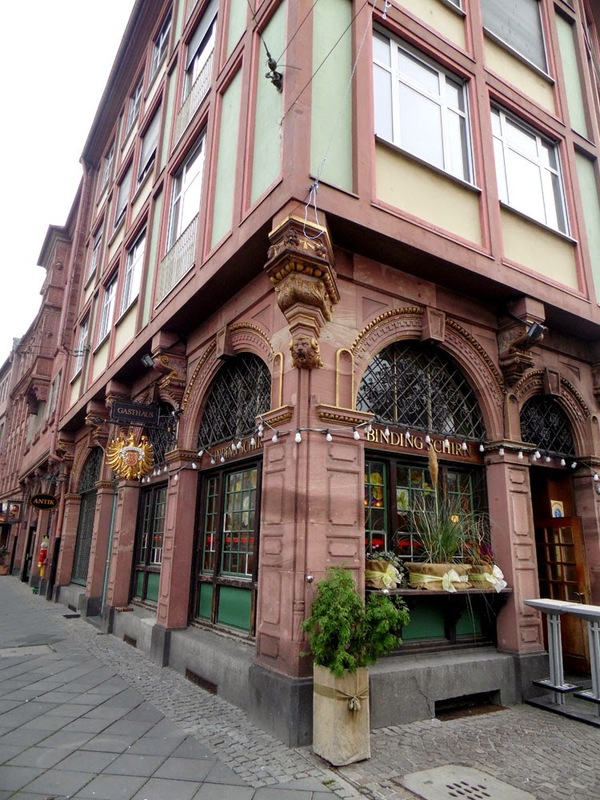 One interesting building is the Steinernes Haus (stone house) built in 1464. It is notable because it was built as a trading house by merchants who had the temerity to build it out of stone. This at a time when only royal palaces or churches were built of stone. Its construction allowed its survival against the ravages of the centuries until that bombing raid in March 1944 when it was gutted. It was rebuilt in 1962, opening with an exhibition of paintings by Edvard Munch. Now it looks to be a quite nice restaurant (but a bit too pricey and classy for the likes of us). "Here met the German pre-Parliament from the 31st of March to the 3rd of April 1848 and the German National Assembly from 18th May 1848 to the 30th May 1849." 1848 is a turning-point in the history of central Europe, particularly for the countries that are now Germany and Austria. In 1806 Napoleon had dissolved the Holy Roman Empire that had dominated central Europe since the Middle Ages (the so-called First Reich). It was not reinstated at the Congress of Vienna in 1815 after Napoleon's defeat. 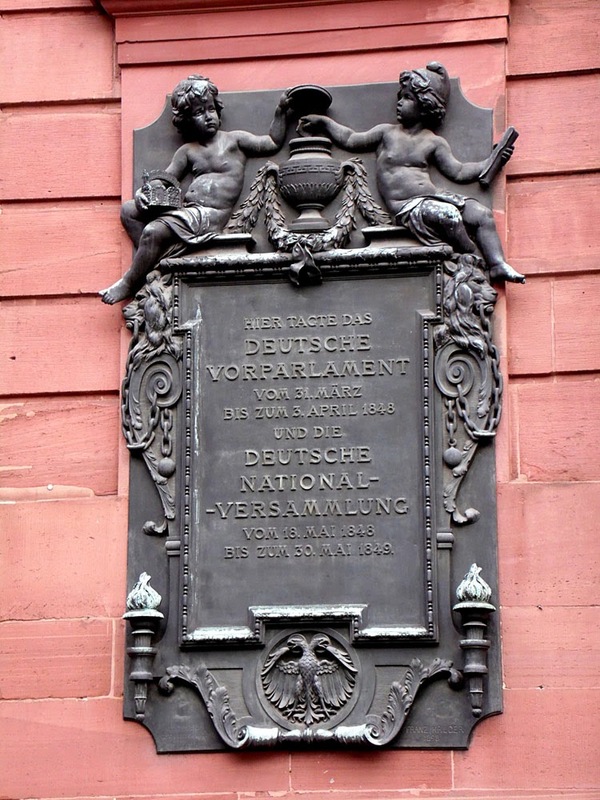 Instead the congress created the German Confederation (Deutscher Bund) to co-ordinate the economies of 42 German-speaking countries, states and free cities. This was dominated by Austria, and in particular by the Austrian Chancellor the Prince von Metternich. But uh-oh, Prussia and Austria, together with a few smaller German countries who could see which way the wind was blowing, rejected the new constitution. In March, the parliament had asked King Friedrich Wilhelm IV of Prussia if he wanted to be crowned king of the new united Germany, which was to be a constitutional monarchy like the UK. Friedrich Wilhelm replied that no, actually, he wasn't prepared to be told what to do by elected members of parliament, but had ideas of his own for ruling Germany absolutely. Austria was also not keen of the idea, because the ruling Hapsburgs had an empire that included non-German-speaking lands, such as in northern Italy, Bohemia and Hungary, and they preferred things to stay as they were, thank-you. Prussian military might quashed the adoption of the constitution and dissolved the National Assembly on 30th May 1849. So much for the first attempt at a united, democratic Germany, though it is notable that for the first time the red-gold-black tricolour which is now the German flag was extensively used. 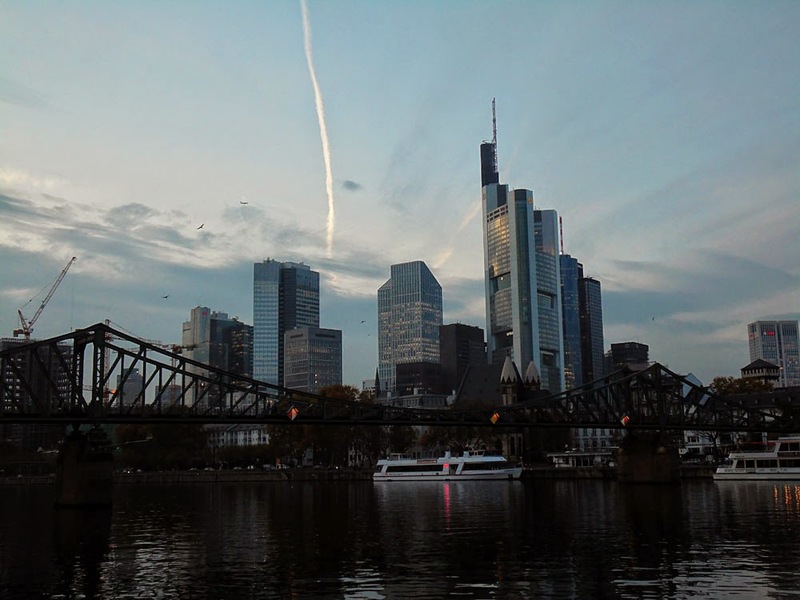 After the devastation of the Second World War the citizens of Frankfurt were keen to resurrect the idea of this first parliament because they were then vying to have Frankfurt become the new capital of a democratic West Germany. It went to Bonn instead. 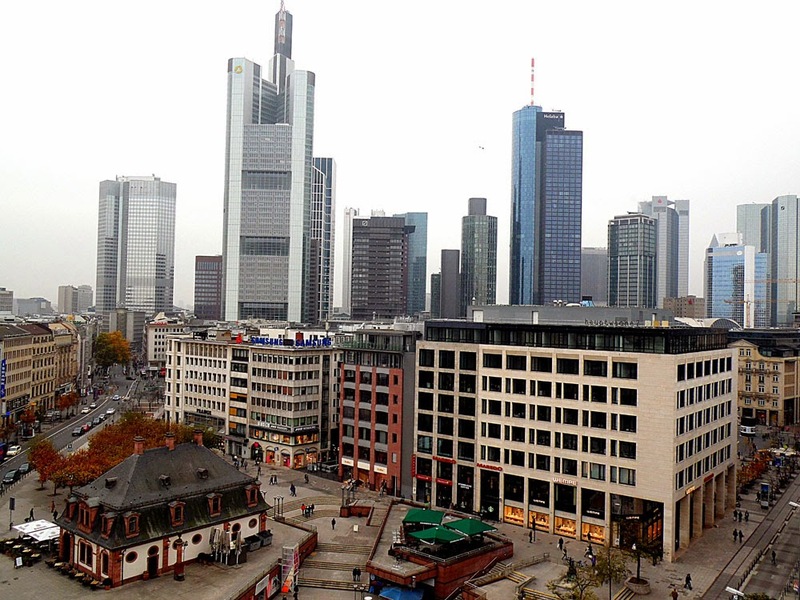 There are other buildings in Frankfurt that haven't been built over with skyscrapers, but not many. 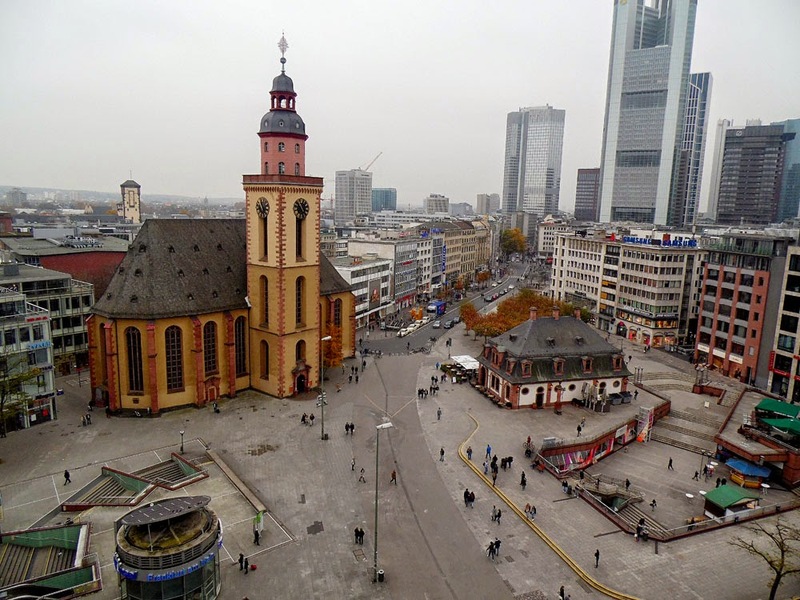 The photo below is a view down onto the plaza an der Hauptwache from the roof-top cafe of the Galeria Kaufhaus department store. 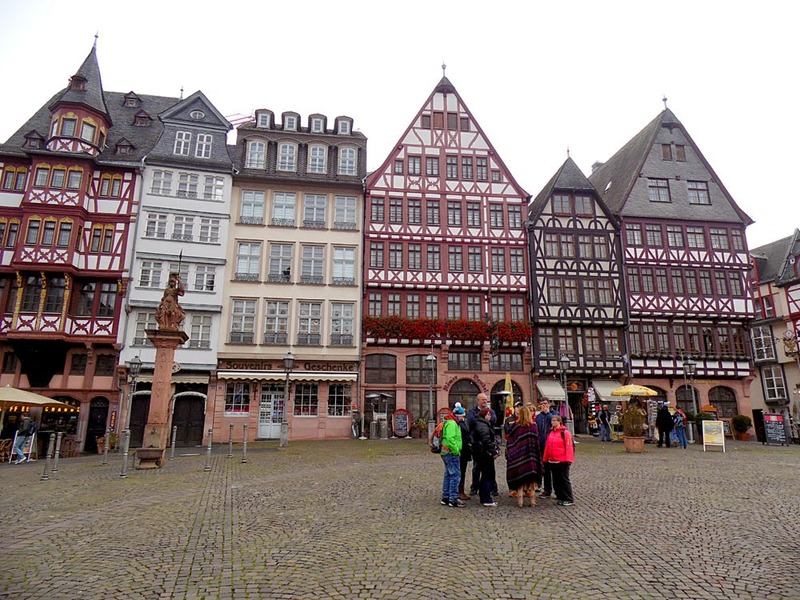 The building bottom left is the Hauptwache (Main Guardhouse) that gave the square its name. This baroque building was designed by Johann Jakob Samhaimer and first constructed in 1739 on the site of the previous, much smaller, guardhouse. This dates from the time when 'The Free Imperial City' of Frankfurt still had city walls and its own City Watch (Stadtwehr). In the cellars were dungeons and on the other floors offices for the City Watch Commander and Officers, rooms for the Privates, and an interrogation room and prison on the attic floor. As a Terry Pratchett fan, I can't help but imagine that Sir Sam Vimes and the Ankh-Morpork City Watch used to be housed there! 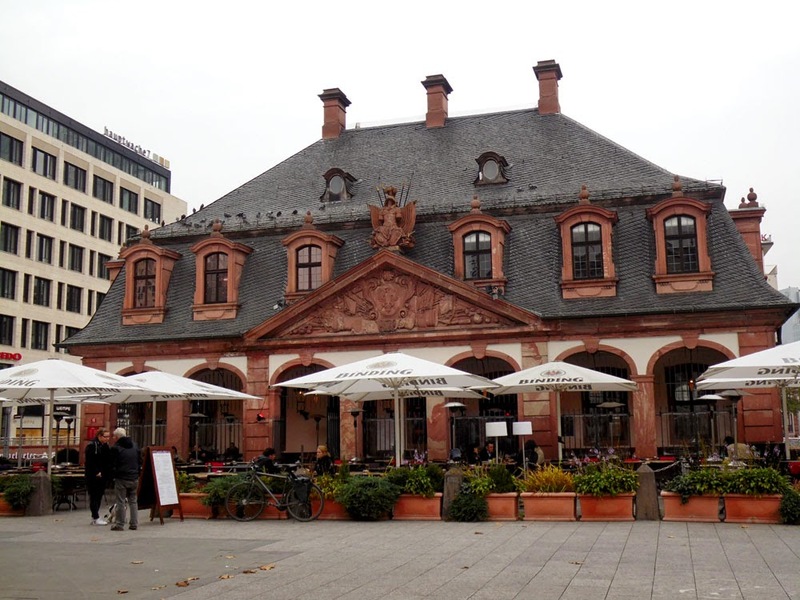 The City Watch lost its role when Prussia annexed Frankfurt in 1866 (amidst much fighting, especially around the Hauptwache - those guys didn't want to go quietly), and then became just a Police Station for a while, then a café since 1905. Oh, and then it got bombed to smithereens in 1944. The present building is a rebuild, in a slightly modified position, above the newly built subway of the same name dating from 1967. It was in this church that the baby Johann Wolfgang von Goethe was baptised. Or maybe he was baptized privately at the Goethe family's house on Großer Hirschgraben where he was born on 28th August 1749. Whatever, the Goethe family certainly had reserved pews at the Katharinenkirche and was frequently visited by the church's Kapellmeister. 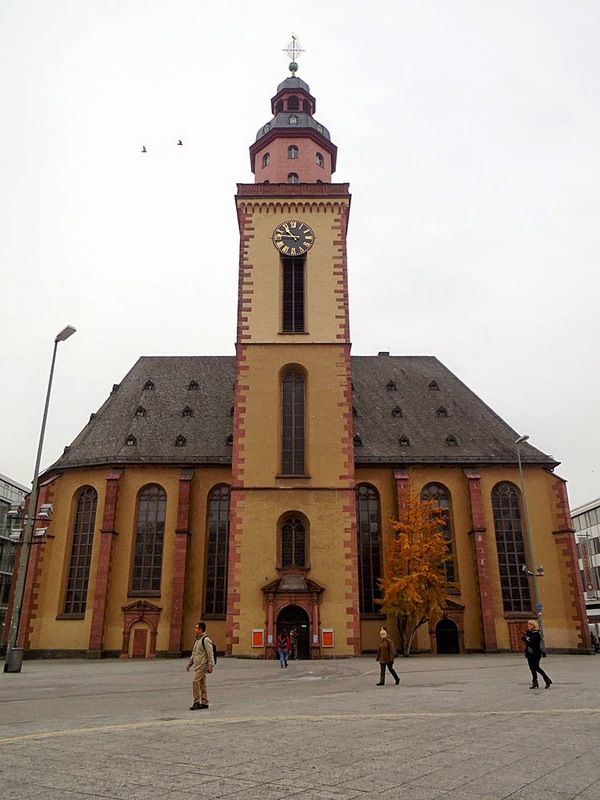 The church was completely burnt down on 22 March 1944, reconstructed 1950-54, and the baroque interior renovated 2001-2005. 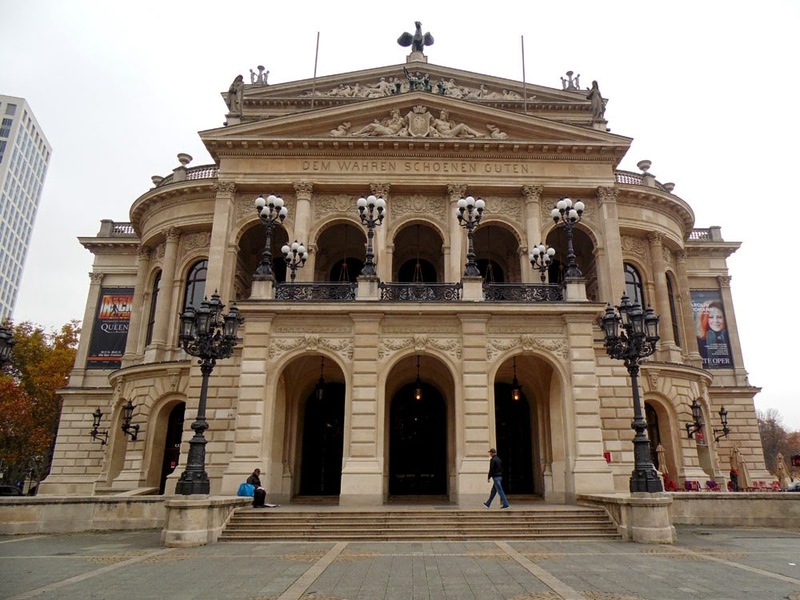 Nearby is another reconstructed building, first inaugerated in 1880, now known as the Alte Oper (old opera house). It was designed by the Berlin architect Richard Lucae. Kaiser Wilhelm I came to the inaugeration (a perfomance of Mozart's Don Giovanni) and was evidently impressed: on stepping on the radiant staircase he declared to director Emil Claar 'Das könnte ich mir in Berlin nicht erlauben' (I couldn't permit myself this sort of thing in Berlin). I don't know why not: he was the Kaiser, and Berlin has had a State Opera on Unter den Linden since his predecessor Frederick II had commissioned it in 1742. Many great works have been performed here, including the premiere of Carl Orff's Carmina Burana in 1937. Currently though they seem to be showing the Queen and Ben Elton opera 'We Will Rock You'. Das könnte ich mir in Berlin - oder irgendwo - nicht erlauben. 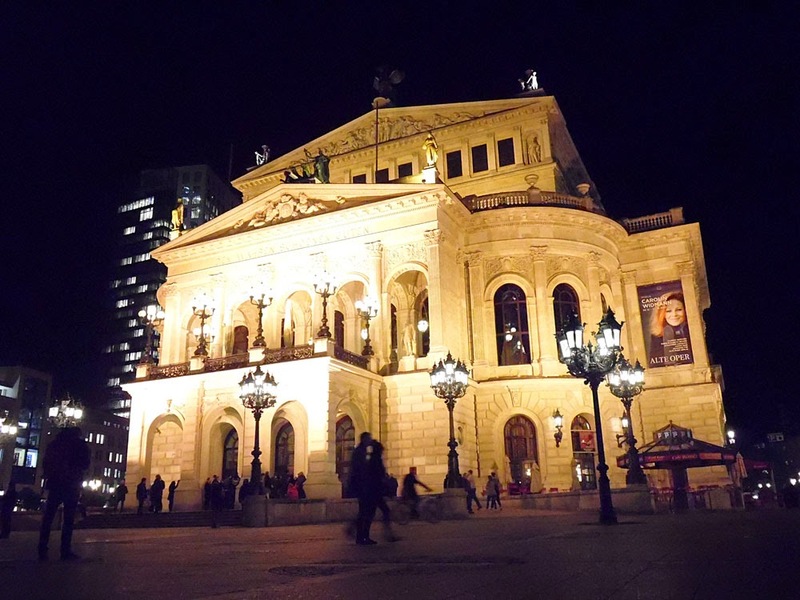 Here is the Alte Oper by night and day. 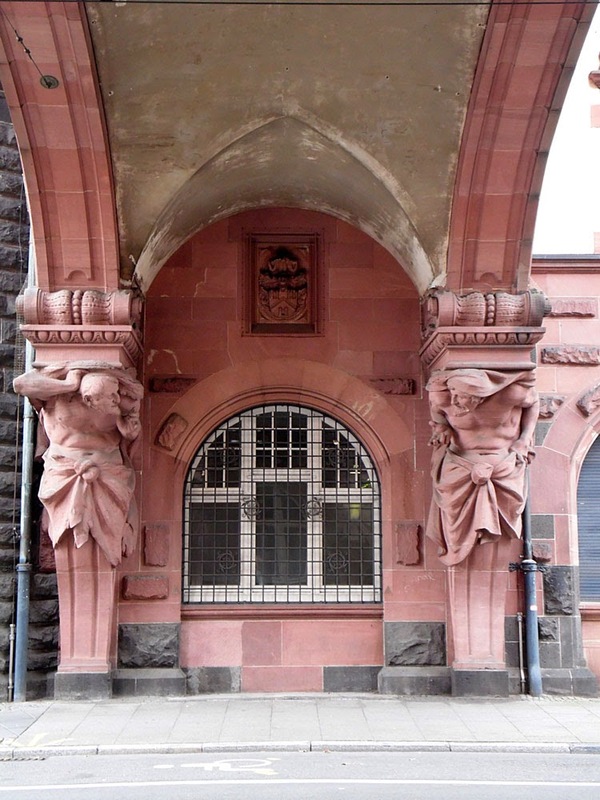 By the way, the inscription about the entrance is "Dem Wahren, Schönen, Guten ", (To the true, the beautiful, the good ). That would be Ben Elton then. 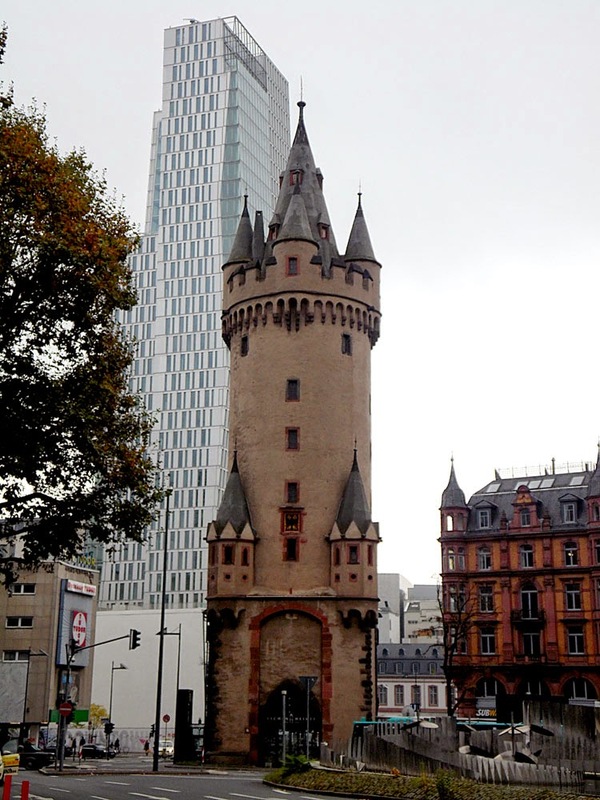 A piece of old Frankfurt that looks sadly orphaned in the urban landscape is the 47m high Eschenheimer Turm, located on a traffic island surrounded by busy traffic. It was built between 1426-1428 and was one of about sixty towers that were set into the city walls. 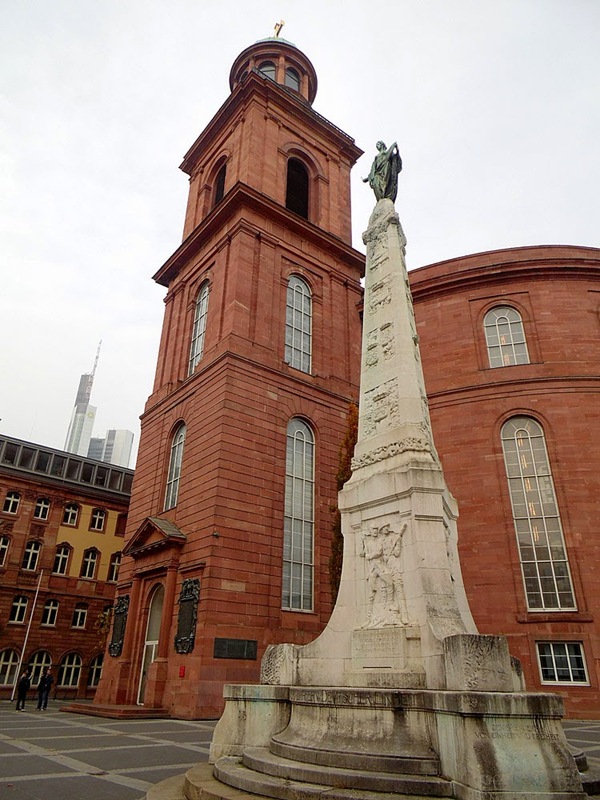 The defencive city walls were torn down between 1806 and 1812, but this tower was allowed to stand as a memorial. It is quite a handsome tower despite its location, and was the inspiration for the Flatowturm built in Schlosspark Babelsberg 1853-56. The Eschenheimer Turm is just north of the pedestrianized shopping precinct know as the Zeil. This is a surprisingly pleasant and interesting area as shopping precincts go. 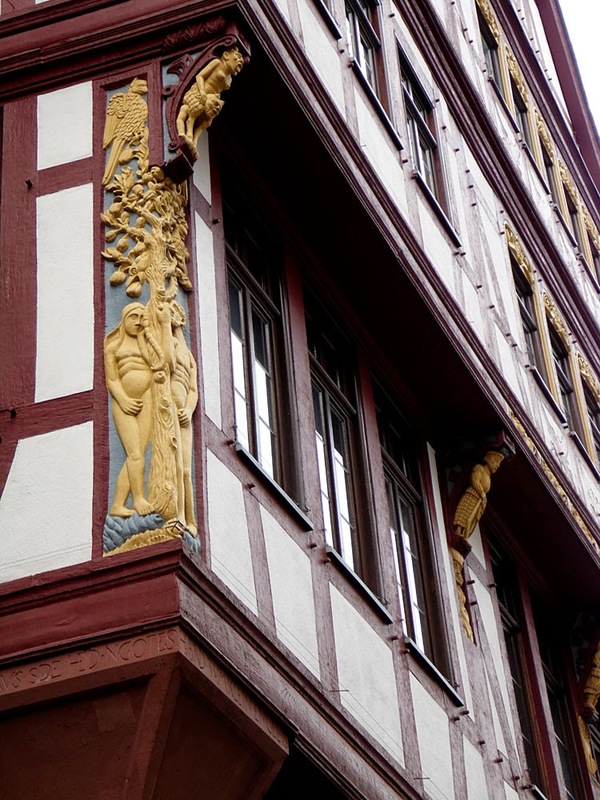 Its name, dating back to the 14th century, derives from the German word Zeile, meaning a row as in a row of houses. It became a magnificent boulevard in the 18th century, gradually attracting smart shops until in the last quarter of the 19th century the new fashion for large department stores made it into a famous and popular shopping street. These grand shopping outlets were destroyed in WWII and were not replaced. Instead the Zeil was widened in the 1950's and over the next decades new department stores were built here. 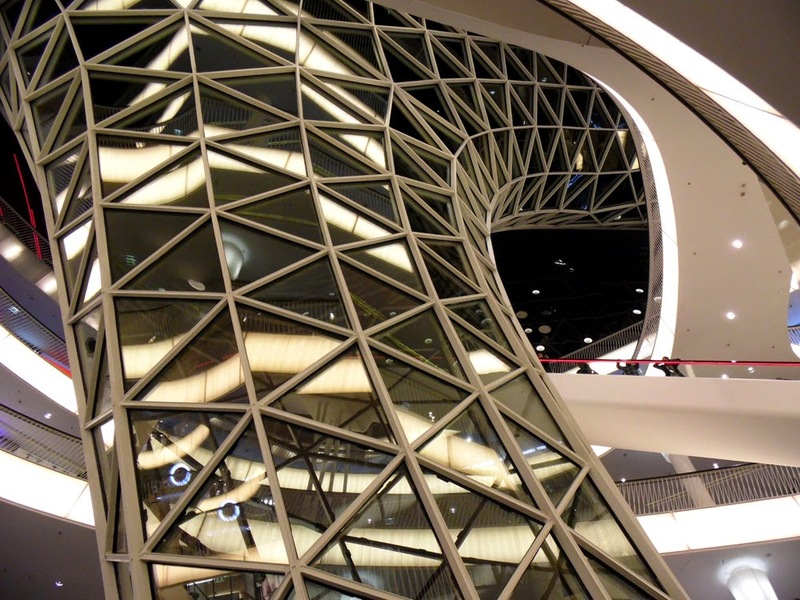 The MyZeil mall looks inside and out like it has been the victim of a space distorting cosmic wormhole suddenly opening up inside it. Even if you don't like shopping, you must go in and have a look, so long as your rational mind doesn't rebel at having to make sense of what you are seeing. 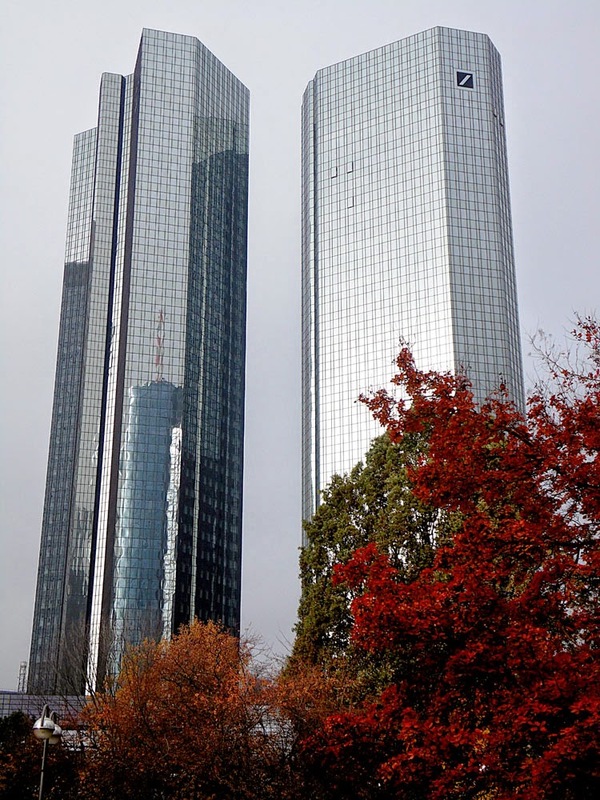 Nowadays the modern architecture, and especially the skyscrapers, define Frankfurt in the popular imagining. The quaint medieval tweeness of the half-timbered buildings around the Römer seem a different city away. Manhattan is often invoked by way of comparison, but to me Frankfurt's smaller scale remind me more of Birmingham, particularly as Birmingham's modern city centre also emerged from the devastation caused by aerial bombing (this time by the Luftwaffe between 1940 and 1943 - the so-called Birmingham Blitz). 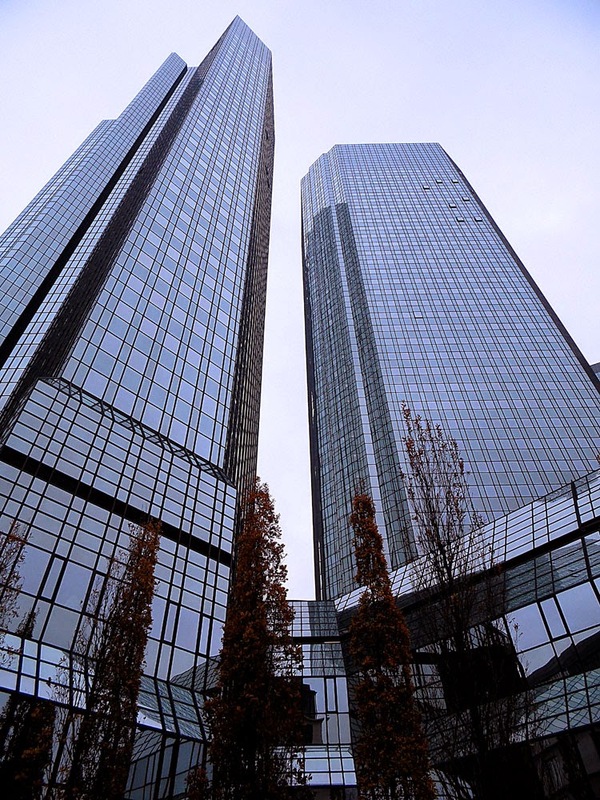 Many of the skyscrapers are the headquarters of banks or financial firms, for example the co-operative bank DZ-bank in the tower at Westendstraße 1, the Swiss financial services company UBS in the Opernturm, investment bankers Goldman Sachs in the Messeturm, American financial services company Standard and Poors and the Landesbank Hessen-Thüringen in the Main Tower ('Main' after the river), Commerzbank in the eponymous tallest tower as well as others, and the Deutsche Bank twin towers. 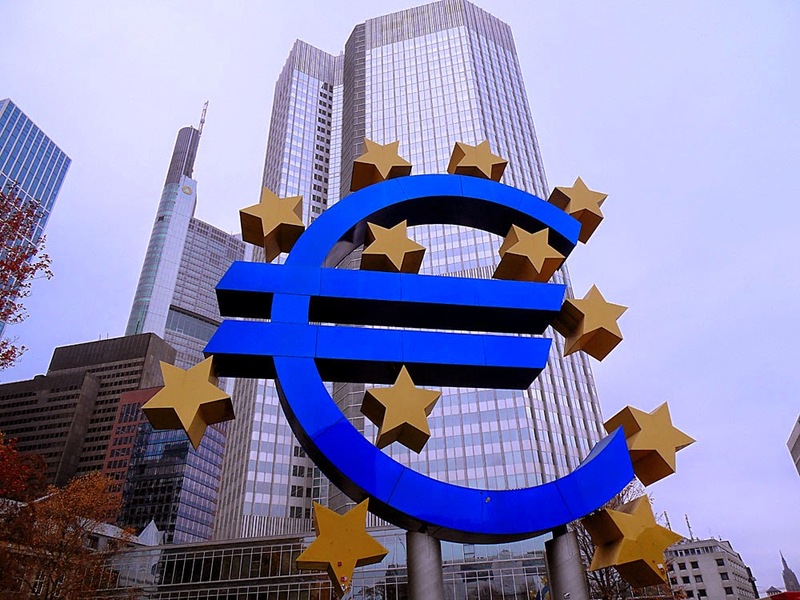 And so on, and so, on including the European central Bank (ECB). 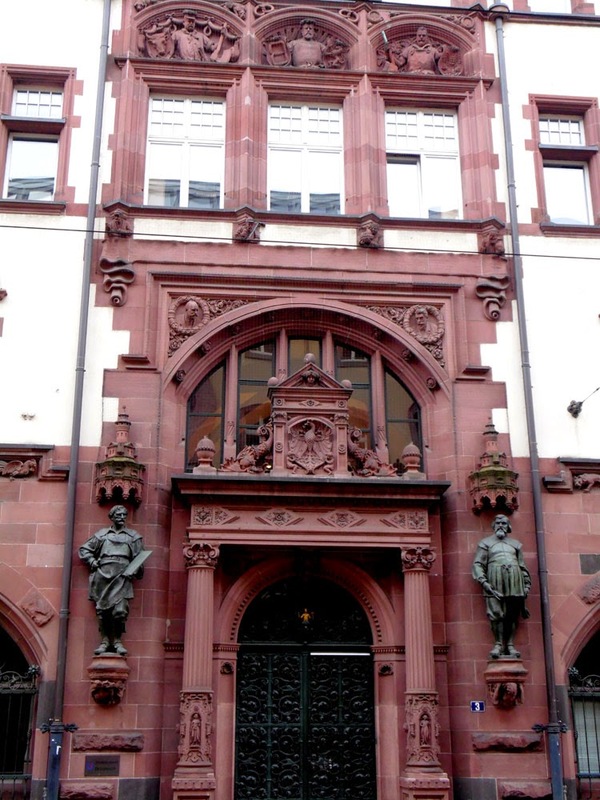 Furthermore, the German stock market index (the DAX) is based on the Frankfurt Stock Exchange, though this is not located in a skyscraper but in a large nineteenth century building on Börsenplatz. 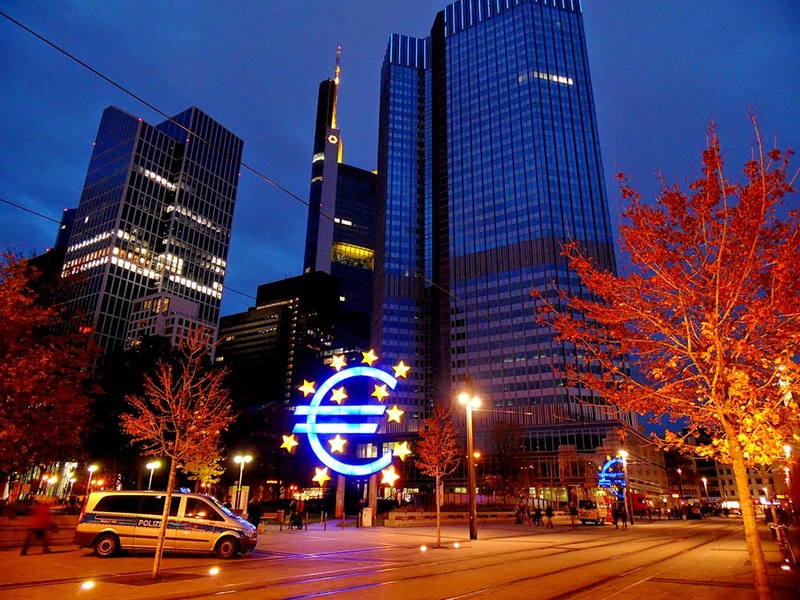 So, as you might know anyway, Frankfurt is very much the main financial centre for Germany. As such, it was one of the suggestions for the new capital for a re-unified Germany after 1989. 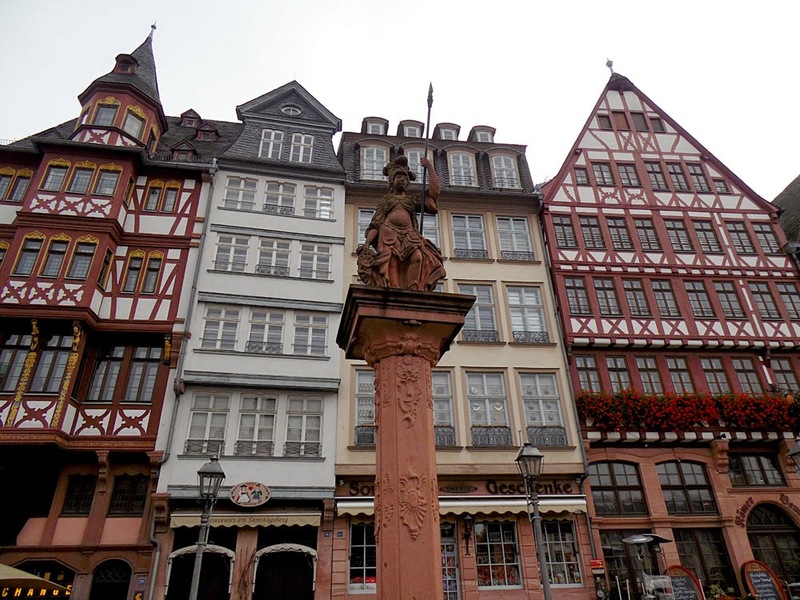 After all, Frankfurt was the place the Electors of the Holy Roman Empire had met since the times of Charlemagne to choose the new emperor, and after 1562 to crown him in Frankfurt cathedral. 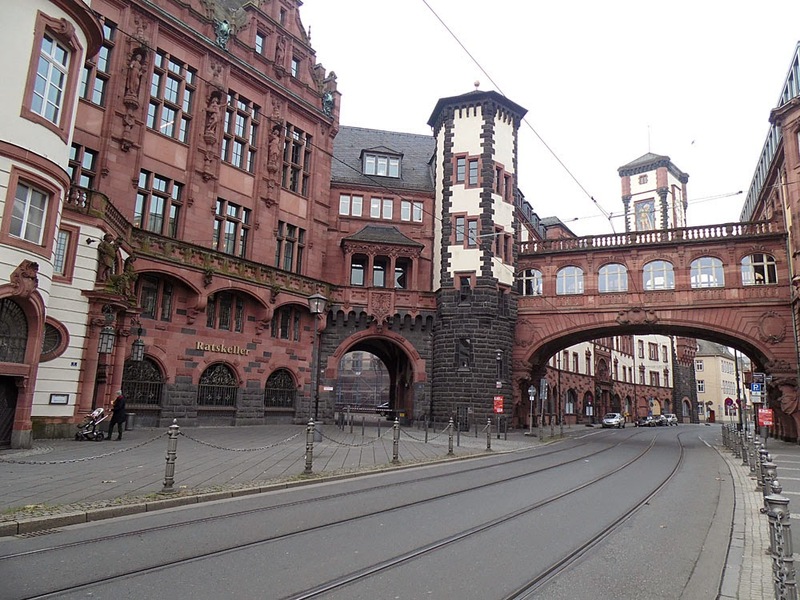 Then it was (briefly) the location of the first democratically elected parliament of a united Germany in 1848-89. 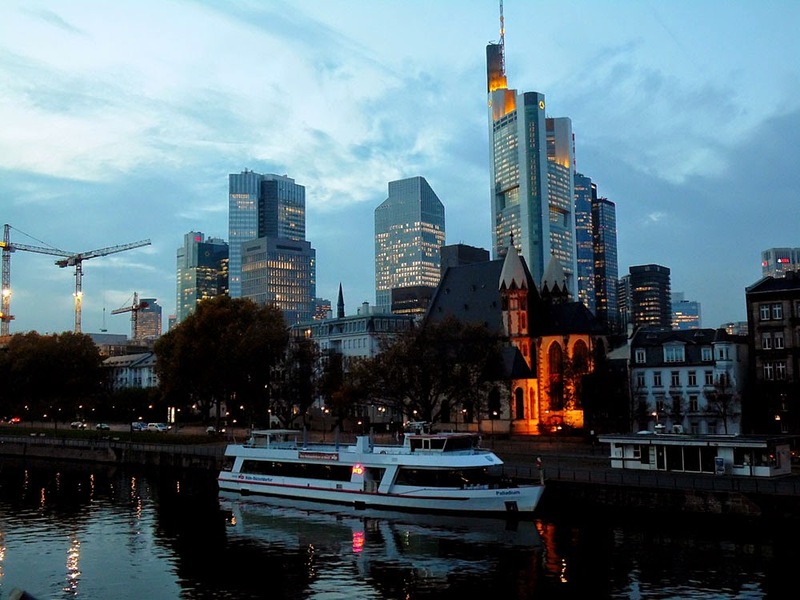 Where better than Frankfurt as the centrally-located symbolic capital of a modern, financially and commercially strong, shining new united Germany? Well as it turned out, the old base of the discredited Prussian Hohenzollerns far out on the Eastern fringes of Germany - Berlin - became the German capital once again. Hurrah! To be honest I'm glad it did, because Frankfurt is culturally nowhere near as vibrant and innovative as Berlin. As I say, a Birmingham rather than a London (or even Edinburgh). Why Beethoven? He has no connection with Frankfurt. Well, why not? There's a memorial to Schiller too nearby. 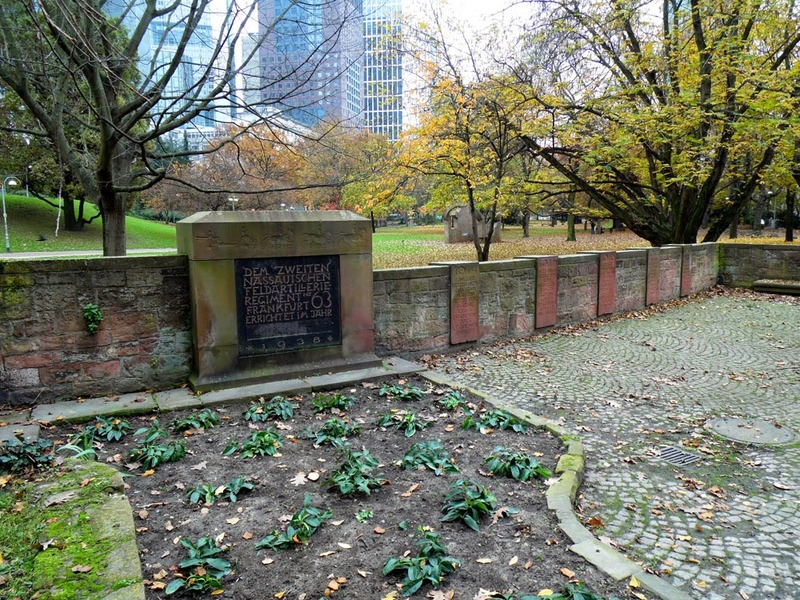 Rather more poignant, at the feet of all these skyscrapers, is a First World War memorial to the fallen of the 63rd (2nd Nassau) Field Artillery Regiment garrisoned in Frankfurt. It looks so lost and unattended here, at a time when the soldiers of WWI are being particularly remembered in Britain on the hundredth anniversary of the outbreak of 'The Great War'. 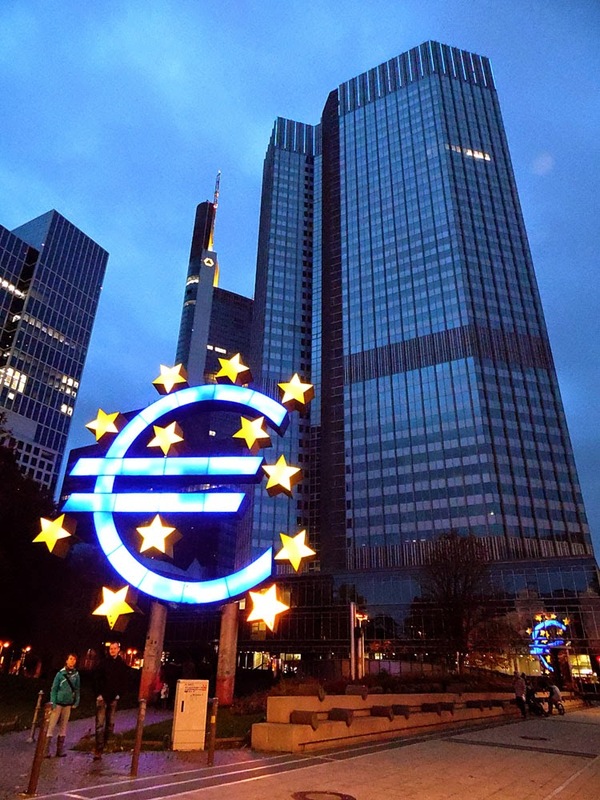 Finally, here is the big Euro symbol in front of the Eurotower (148m, 39 floors), HQ of the European Central Bank (ECB). Though they might have moved into their new headquarters by the time you read this. It seems to have a permanent Polizei presence, maybe in case Greek or Spanish protesters turn up complaining about the austerity measures demanded by the bank for getting a loan. 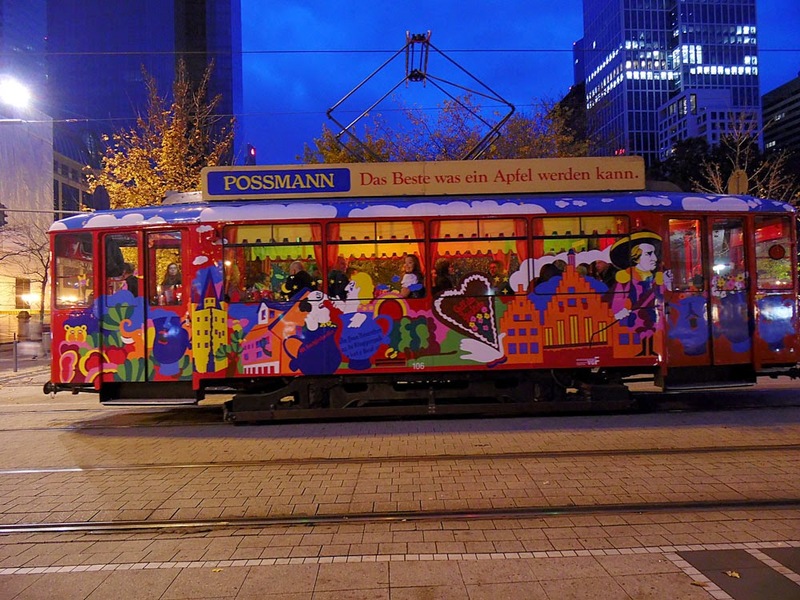 I said at the start that we had come to Frankfurt in search of Apfelwein, or zoider as they call it in Zummerset. Well, we never got around to drinking it though we saw it on sale everywhere. They even seem to prefer it hot! Weirdos. We did however see the Ebbelwei-Express, which looks a fun way to site-see the city ( 8€ with a bottle of apple-wine / cider and a bag of biscuits thrown in). 'Ebbelwei' is the way that the locals pronounce 'Apfelwein' you see. Especially after they have had a few of them. 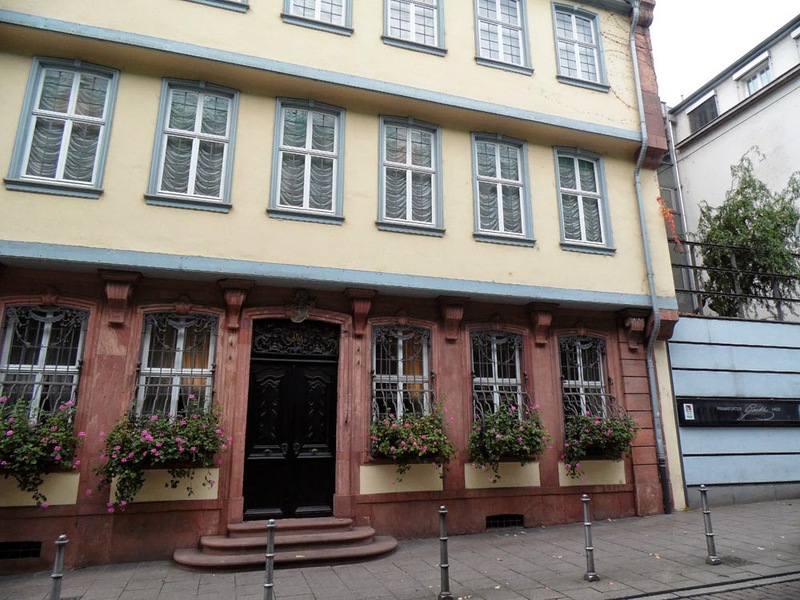 We stayed at the Hotel Primus in the Sachsenhausen area of Frankfurt South of the river. It was adequate. Not splendid, but fitted our needs and small budget. 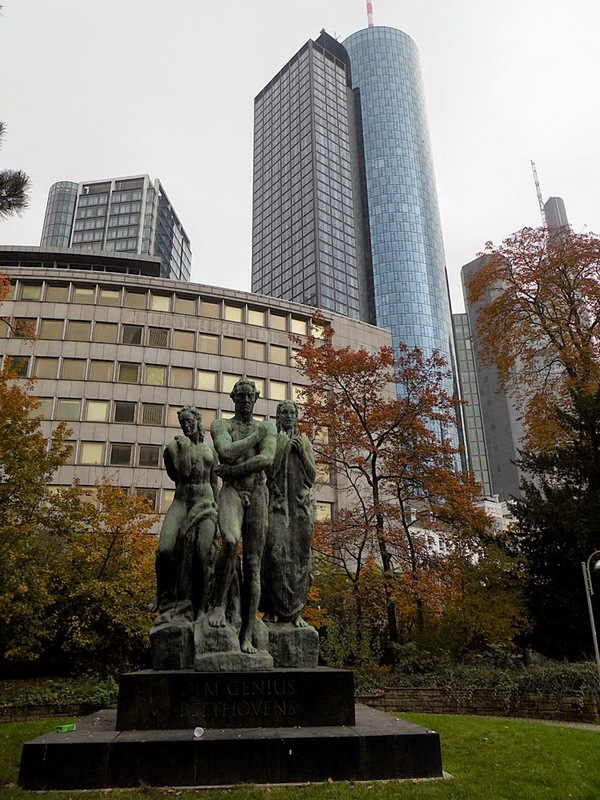 You can read my TripAdvisor review of the Primus Hotel Frankfurt here. The best meal we had in Frankfurt (and probably the best curry I've had in Germany for a while) was at the Saravanaa Bhavan on Kaiserstr. near the Hauptbahnhof. Read my TripAdvisor review of the Saravanaa Bhavan here. Unless you are flying into Frankfurt International Airport, take a good book and stock up your mp3-player for the probably very long journey.